Note: This post was guest authored by Jenna Mellor, Associate Director of Point Source Youth. Point Source Youth is thrilled that the National Center for Excellence in Homeless Services (the National Center) is a presenting sponsor of the upcoming Second Annual Symposium on Solutions to End Youth Homelessness. This nationwide convening of leaders addressing youth homelessness—from providers to youth, policy experts to researchers—is co-sponsored by New York University’s Silver School of Social Work (a partner of the National Center) and the McSilver Institute of Poverty, Policy, and Research, and will be held at New York University’s Kimmel Center on April 30th and May 1st, 2018. The participation of the National Center is especially critical because social workers are at the forefront of supporting individuals experiencing homelessness. Social workers are well-positioned to demand the systems change needed to re-imagine the cycle of displacement for youth experiencing homelessness – a cycle perpetuated by traditional shelter models. Excellence includes embodying what we know are best practices in the field: Housing First, positive youth development, trauma-informed care, anti-racism and equity practices, and ensuring that youth are meaningful collaborators in the solutions that impact them most. Leaders in social work practice, research, and education were instrumental to the success of last year’s symposium and in planning exciting, new content for this year. We are excited to have presenters from three of the National Center’s partner schools – NYU, the University of Southern California (USC), and Hunter College. Drs. Deborah Padgett (NYU) and Ben Henwood (USC), national co-leaders of the Academy for Social Work and Social Welfare’s Grand Challenge to End Homelessness, will both be presenting. Dr. Padgett is on our planning committee and will lead an interactive breakout session on innovative research. Dr. Henwood (USC) will present on his work at the intersections of health, technology, and youth homelessness. Dr. Jama Shelton (Hunter College) also serves on the planning committee, and is partnering with planning committee member and youth advocate Sophie-Rose Cadle to plan a breakout session on centering the leadership and self-defined priorities of trans and gender expansive youth experiencing homelessness. Continuing Education Credits will be provided by NYU. Other presenters include Drs. Eric Rice and Robin Petering (both of USC) and Dr. Matthew Morton (Chapin Hall). Dr. Morton will present on the monumental data released by the Voices of Youth Count project, which shows the scope of youth homelessness nationally and the disproportionate experiences of youth of color, queer youth, and parenting youth. The findings were recently released in their Missed Opportunities report and have motivated many of us to do more and do better. For more information about Missed Opportunities and its implications for social work, check out the National Center’s recent blog post on the topic. We look forward to seeing new and familiar faces at this year’s symposium. And, for those of you interested in learning more about the National Center, Amanda Aykanian, the National Center’s Research and Project Lead, will be attending both days. Blog Post Author: Jenna Mellor (pictured left), Associate Director at Point Source Youth, is a harm reduction advocate with nine years of experience at the intersection of direct service and program development. Her work is rooted in the principles of bodily autonomy and human dignity, and she is passionate about Point Source Youth’s goal of building the evidence base for Housing First practices in youth housing. It’s National Hunger and Homeless Awareness Week, and this year, we are seeing a continuing trend. More cities across the country are trying to address the problem of homelessness through ordinances that criminalize life-sustaining activities such as sleeping, eating and even sitting on the street, in parks, on the beach or other public spaces. This is wrong and does nothing to address the problem. Such measures actually make ending homelessness more difficult because the associated fines and criminal records create additional barriers to finding employment, securing housing and accessing other public services. Nor do they make sense from a cost perspective because they impose greater demands on an already overburdened criminal justice system. The cost of housing an individual in jail is often three times as great as housing that person in a shelter. Although it sounds naïve, there is an element of truth to that statement. Prior to the 1980s, we did not have the kind of mass homelessness we now experience. There was a surplus of 300,000 affordable housing units in 1970, according to the Institute for Children, Poverty & Homelessness. But in the 1980s, affordable housing began to disappear as the federal government cut funding for housing assistance. By 1985, there was a shortfall of 3.3 million units nationwide. By 2009, the shortfall in affordable housing units had increased to 5.5 million units. Many communities have tried to manage the problem by creating emergency shelters and other temporary services to meet the immediate needs of people experiencing homelessness. However, they have not committed the necessary resources to help such people transition into permanent housing. If we are serious about ending homelessness and not just managing the problem, we must create more opportunities for permanent housing for those experiencing homelessness. One approach that has shown promise is called Housing First. Traditional approaches to housing people experiencing homelessness has demanded that they meet certain criteria before they are eligible for permanent housing, such as completing some intervention, avoiding arrests or remaining sober for some period. The Housing First approach centers on getting people housed as quickly as possible and then providing the services needed to maintain that housing. The vast majority of individuals and families become homeless because of a personal crisis such as the loss of a job, a major medical expense, or family violence. For them, the Housing First approach is ideal because it provides them with the assistance they need to find permanent housing quickly and without conditions. Data show that the more quickly such individuals and families secure permanent housing, the more likely they are to remain housed in the future. For those troubled by the lack of up-front requirements in Housing First, take comfort in your wallet. The Department of Housing and Urban Development estimates that if we don’t house these individuals, it will cost a community up to $50,000 per individual per year because of the high costs associated with public services such as emergency room visits and incarceration. The data behind Housing First show that it is less financially risky for a community than the alternative of not housing those who need housing assistance. For those experiencing chronic homelessness — about 15 percent of the homeless population — Housing First is also a viable approach, but the expectation is that the need for specialized and intensive services may continue indefinitely. This approach, often referred to as Permanent Supportive Housing, combines affordable permanent housing with a tailored package of supportive services. In Austin, Dallas and Houston, homeless advocates are working with managed care organizations to better design programs that link housing and health care, recognizing the effect both have on each other. We can end homelessness — but only if we address the shortfall in affordable housing and use proven strategies to stabilize those who are experiencing homelessness. Having laws that criminalize life-sustaining activities is not one of those strategies. About the Author: Cal Streeter is the Meadows Foundation Centennial Professor in the Quality of Life in the Rural Environment in the School of Social Work at the University of Texas and a member of the board of directors for the Austin-based nonprofit Ending Community Homelessness Coalition. On January 7, 2015, Mayor Mitch Landrieu announced that New Orleans had become the first city in the U.S. to end Veteran homelessness. On a recent webinar, staff from the Mayor’s Office, the City’s housing department, the local Continuum of Care (CoC), and the local Department of Veteran Affairs (VA) discussed how the city accomplished this feat. In June 2014, Michelle Obama helped to launch the Mayors Challenge to End Veteran Homelessness by the end of 2015. Mitch Landrieu is one of the over 500 mayors, governors, and city officials who committed to this challenge. Accepting this challenge did not come with any additional resources or funds, so communities had to be creative and innovative. New Orleans’ strategy evolved over time, adapting to barriers as they came up. Ultimately, New Orleans became the first city to meet the White House’s challenge, and they did it a full year before the deadline. Below is a brief description of the key components of their success. Collaboration: Successful implementation took collaboration and support from multiple stakeholders, including USICH, HUD, the VA, the housing authority, local service providers, local government officials, and local military and veteran organizations. Example: The team worked with the local VA to check the veteran status of individuals and was able to convince the VA to prioritize these checks. This resulted in a typical 3-4 day process being reduced to just 24 hours or less. Housing Location: This included negotiating with local housing programs – the housing authority, the CoC, and VASH and SSVF programs – to secure access to housing vouchers, including supportive housing. Networking with landlords was key for securing housing units. Example: The team worked with the Housing Authority to use turnover vouchers (vouchers that had been given up, revoked, or had expired) to move stable individuals, who no longer needed intensive support services but did need rental assistance, off of supportive housing vouchers (e.g. SSFV or VASH). This freed up supportive housing vouchers for homeless veterans. The City recruited community members to assist with street and shelter outreach, as well as a source of time, resource, and financial donations. Example: Current and former military members helped with street and shelter outreach. Tracking and Sharing Progress: The City used the annual point-in-time count as a motivator and baseline indicator, understanding that the count is imperfect. They also developed a master list of individuals to be housed and provided routine updates. Example: Weekly update meetings were used to share progress and discuss challenges. This kept the whole team motivated and on the same page. Every community brings its own unique context, and New Orleans is no exception. Hurricane Katrina brought a sense of urgency to addressing homelessness. The city was “homeless together” after Katrina. The city built on this existing momentum for the Mayors Challenge. However, the strategies listed above can be adapted and successfully implemented in any community. The panelists offered the following advice for others interested in ending veteran (or any other kind of) homelessness. The webinar has been archived on the HUD Exchange. A new book about Housing First by Professor Deborah Padgett at NYU’s Silver School of Social Work, co-authored with Benjamin Henwood (USC-Social Work) and Sam Tsemberis (Pathways to Housing, Inc.), will be released this fall. 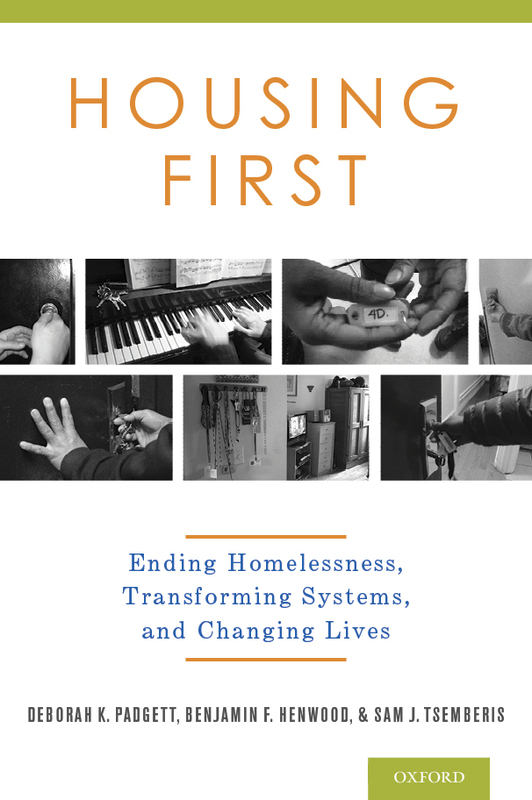 Housing First: Ending Homelessness, Transforming Systems, and Changing Lives (Oxford University Press) is the first book to tell the story of this groundbreaking approach. In this book, Housing First (HF) is described as an unusual combination of evidence-based practice, consumer choice, and the right to housing. Authors Padgett, Henwood, and Tsemberis (the founder of Pathways to Housing) trace the history of homelessness in the United States and report on the rise of a “homeless industry” of shelters and transitional housing programs after the 1980s. The HF model challenged the standard ‘staircase’ or linear continuum by not requiring compliance with treatment, sobriety, and ‘housing readiness’ before gaining access to one’s own apartment. Beginning with its origins in New York City in 1992 with the formation of Pathways to Housing, Inc., the HF approach has quickly spread to cities around the United States, Canada, Australia, and Western Europe. Housing First has been unprecedented in its influence on housing policies in the U.S. and abroad and is credited with ending homelessness for veterans in several U.S. cities as well as ending chronic homelessness in the state of Utah. After a five-city experimental trial, HF is now the national policy in Canada. While it has only begun to be applied to families and young adults, HF principles of immediate access to housing, support services, and harm reduction hold promise for engagement and stabilization. The book summarizes what is known about Housing First, including qualitative findings from the New York Recovery Study led by Padgett and Henwood (funded by the National Institute of Mental Health). In addition to analyzing HF as a source of systems and organizational change, the book features first-person accounts of life after obtaining housing and services. The success of HF has shown that providing immediate access to an apartment and support services to homeless persons with ‘dual diagnoses’ is not only humane but effective.